1927 The Seventeen Mile Drive by: Jo Mora - theVintageMapShop.com - the Vintage Map Shop, Inc. 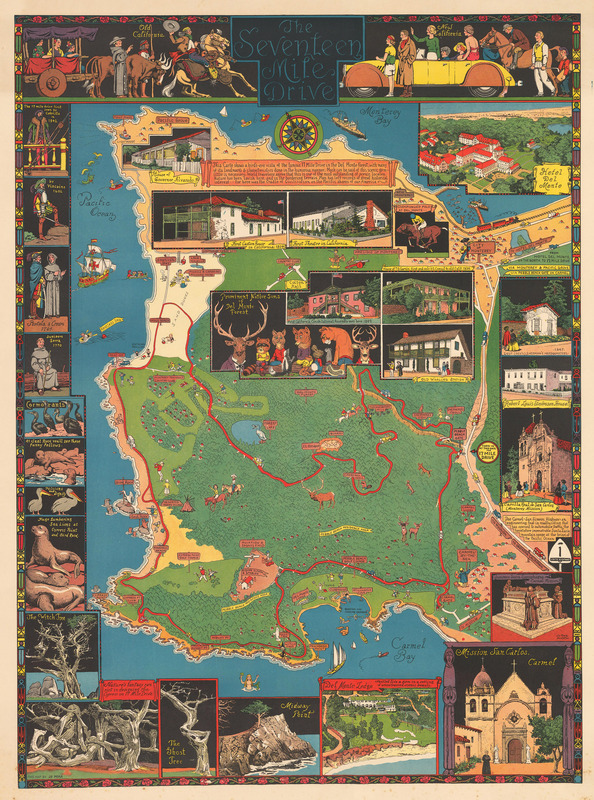 This is a fine reproduction of an eye-catching and highly sought after poster was the second map/poster made by the Uruguayan-born artist-historian, illustrator, sculptor, photographer and author, Jo Mora. Born in Uruguay in 1876, his family moved to New York City in 1880. Mora first studied art at the Art Students League of New York and then the Cowles School in Boston. After working for various firms on the East Coast, Mora moved to California in 1903, where he visited many missions and rode the Mission Trail (aka The King’s Highway) on horseback. The Seventeen Miles Drive was commissioned by the Del Monte Company to advertise its 17 Mile Drive area, and other attractions on the Monterey Peninsula. A number of insets enhance the already attractive map. Cabrillo views the Drive for the first time in 1542, followed by Sebastian Viscaino in 1602. Other insets feature local flora and fauna and landmarks along the Drive. This poster is from the first printing as is distinguished by the mark ‘This Map by Jo Mora’ in the lower left margin. Later editions had the notation ‘Del Monte Properties Co.’ in the lower right margin. Known as the ‘Renaissance Man of the West’, Mora led an active life which included studies in many fields in addition to those mentioned. Starting in 1904 he actively investigated indigenous peoples of the American Southwest such as the Hopi and Navajo Indians, with whom he lived for two years. Such was his dedication to understanding them that he lived with them, lived as they did, learning their language, arts, religious practices and sacred dancing. The photographs are preserved at the Smithsonian.